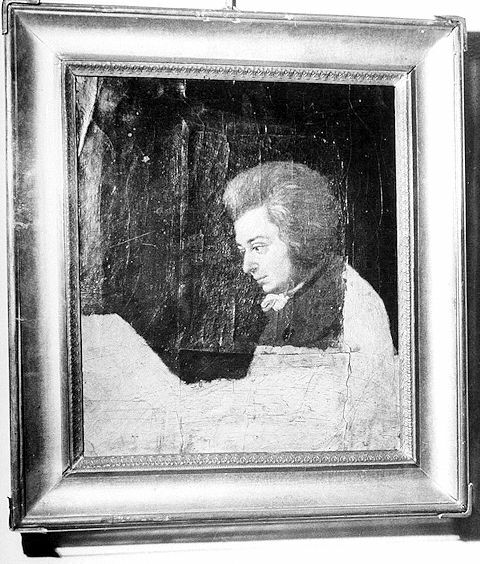 Joseph Lange's unfinished portrait of Mozart is one of the most popular and best known images of the composer. 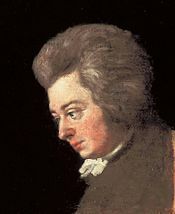 Its somber coloring and its unfinished state have made it a visual icon of Mozart in his Vienna years. Mozart's life, being tragically cut short, is hauntingly paraphrased by the incompleteness of the painting. I have been studying Joseph Lange's life and work for over ten years and I assume in all modesty that I have seen more of Lange's paintings than anybody else. Lange's Mozart portrait has been the object of my scrutiny for a long time and I have always been intrigued as to how its appearance and its state of preservation have changed during the last 60 years. Moreover, I was always sceptic regarding its supposed "state of incompleteness", which, owing to the unusually straight edges of paint on Mozart's body, is at odds with many other unfinished paintings I know. Could it be that the painting was not unfinished, but represents an enlargement of an orignal small portrait which then was never completed? There is a model for this particular procedure: Lange's portrait of Constanze Mozart which today is on display in Glasgow. That this painting is an enlarged version of a small portrait (previously 18 x 13 cm, now 32,3 x 24,8 cm) has long been known and has been pointed out several times in the literature, most recently in the catalog of the 1991 Mozart exhibition in Salzburg. The irregular size of the original portrait (as shown approximately in the following picture) was caused by cutting and the obviously bad state of canvas quality on the lower left corner of the original painting. The enlargement was either sewn or glued to the original painting after it had been turned about eleven degrees to the right. Given the current state of the painting, the different canvas of the small original portrait is only discernible as a slightly lower rectangular area, when looked upon in a very flat angle in backlight. Therefore I concluded that in the course of the enlargement the small painting was mounted from behind to the larger canvas. The Mozart portrait by Joseph Lange is not an unfinished painting of "Mozart at the Piano", but an unfinished enlargement of an original miniature of Mozart's head. What are the implications of this discovery? The original miniature portraits of Mozart and his wife, painted by Lange, both of which were later enlarged, could well be the two small paintings that Mozart sent to his father in April 1783. The Mozart miniature portrait from 1782-83 is "lost", because for over 200 years it has been hidden in plain sight in the supposedly unfinished painting of Mozart at the piano. 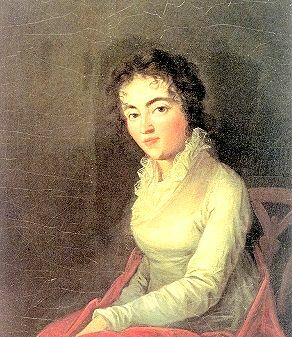 Constanze's small portrait was successfully resized, while the enlargement of Mozart's portrait – at some time sent back to Vienna – was never completed. 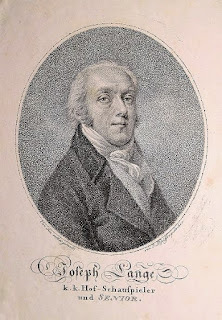 That Lange had not finished the work by 1812 may well have been caused by the fact that at this time he had long separated from Constanze's sister and had started a third family with a woman 30 years his junior. 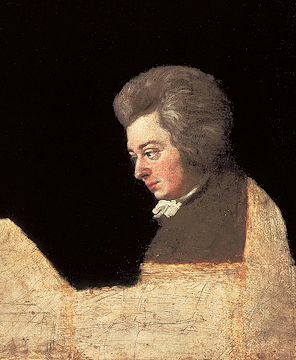 The enlargement with the addition of the piano could have been the work Mozart was referring to in his 1789 letter from Dresden ("an den Portrait fortgearbeitet"). Recently some pseudo-scholars tried to cast doubt on the authenticity of the Lange portrait. Their aim was twofold: first, to boost the credibility of the so-called Hagenauer Mozart which simply doesn't resemble the man on Lange's painting. And second, to add probability to the absurd idea that "the man in the red frock" could have been the small portrait that Mozart sent to Salzburg in 1783. 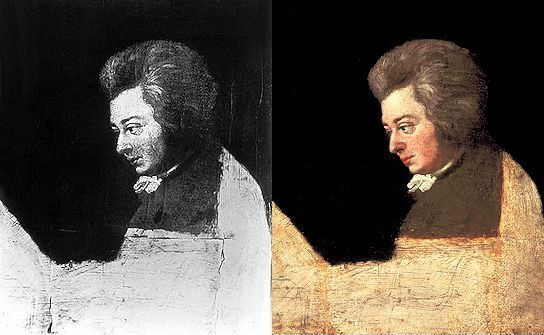 One proponent of this crude hypothesis even went so far as to visualize Mozart wearing a pigtail on the Lange portrait, which (original quote) "can't be seen because of the chiaroscuro[!]". Very impressive and persuasive. This clears up a lot of misinformation about the portrait. Amazing! And perhaps the most amazing thing of all is the fact that the Mozarteum was unaware of what was done to the painting by its own staff. Now all I need to know is why, given Lange's obvious talent, the Constanze portrait is so very BAD? Some very heavy-handed retouching, perhaps? Bravo Michael. Your article strongly suggests that over-familiarity with reproductions can be damaging to one's investigative powers. Now I'd be interested to see if an x-ray/infared analysis of the Constanze portrait could reveal any additional information. This is an interesting and compelling hypothesis for the possible dating of the Lange. 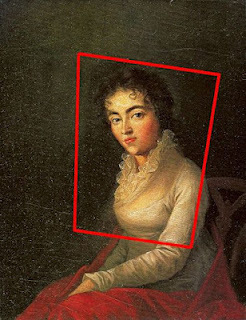 In all fairness, it should be pointed out that in 2010, Robert Münster – while not drawing all the conclusions given here - published an article in Mozart Studien that already described and pictured the Lange in its “original” smaller state, noted that it more or less exactly approximated the original size of the Constanze portrait, and put forward the hypothesis that Mozart’s letter of 16 April 1789 refers, in fact, to an enlargement of the Lange; see his “Die Mozart-Porträts des Joseph Lange,” Mozart Studien 19 (2010), 281-295, especially 285-286. I know Münster's article which IMO is very unspecific regarding the details and their implications. When I realized the enlargement of the Lange painting back in March 2009, Münster's article was not published yet. A compelling and informative blog. Have recommended it. I have a question : how can one reconcile what you discovered and this footnote Geneviève Geffray wrote in her translation of the Mozart Correspondence ? I suppose that the two companion portraits (enlarged, because these were no longer miniatures) were sent and that there is a mistake in the 1804 source ? "Pastel" ? Where does THIS come from ?